UV/H2O2, UV/H2O2/Fe (II) and UV/H2O2/Fe (III) processes are very effective in removing pollutants from wastewater and can be used for treatment of dyestuff units wastewaters. In this study, Rhodamine B was used as a typical organic dye. Rhodamine B has found wide applications in wax, leather, and paper industries. The results from this study showed that this dye was degradable in the presence of hydrogen peroxide under UV-C irradiation (30W mercury light) and Photo-Fenton process. The dye was resistant to UV irradiation. In the absence of UV irradiation, the decolorization efficiency was very negligible in the presence of hydrogen. 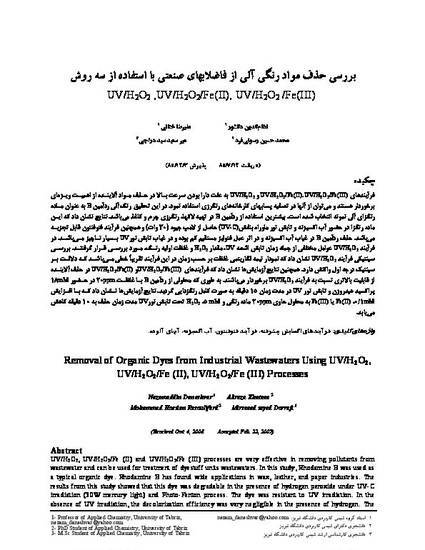 Theeffects of different system variables such as initial dye concentration, duration of UV irradiation, and initial hydrogen peroxide concentration were investigated in the UV/H2O2 process. Investigation of the kinetics of the UV/H2O2 process showed that the semi-log plot of the dye concentration versus time was linear, suggesting a first order reaction. It was found that Rhodamine B decolorization efficiencies in the UV/H2O2/Fe (II) and UV/H2O2/Fe (III) processes were higher than that in the UV/H2O2 process. Furthermore, a solution containing 20 ppm of Rhodamine B was decolorized in the presence 18 mM of H2O2 under UV irradiation for 15 minutes. It was also found that addition of 0.1 mM Fe(II) or Fe(III) to the solution containing 20 ppm of the dye and 5 mM H2O2 under UV light illumination decreased removal time to 10 min.